Planning a daily menu isn't difficult as long as each meal and snack have some protein, fiber, complex carbohydrates and a little bit of fat. 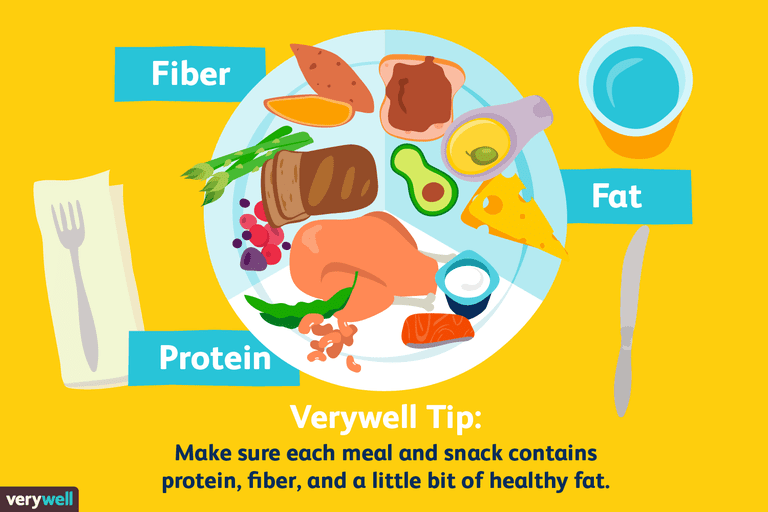 Here's what you need to know about each meal. Eating breakfast will help you start your day with plenty of energy. Don't ruin your breakfast with high-fat and high-calorie foods. Choose some protein and fiber for your breakfast, and it's a good time to eat some fresh fruit. A mid-morning snack is totally optional. If you eat a larger breakfast, you may not feel hungry until lunchtime. However, if you're feeling a bit hungry and lunch is still two or three hours away, a light mid-morning snack will tide you over without adding a lot of calories. Lunch is often something you eat at work or school, so it's a great time to pack a sandwich or leftovers that you can heat and heat. Or, if you buy your lunch, choose a healthy clear soup or fresh veggie salad. Dinner is a time when it's easy to over-eat, especially if you haven't eaten much during the day, so watch your portion sizes. Mentally divide your plate into four quarters. One-quarter is for your meat or protein source, one-quarter is for a starch, and the last two-quarters are for green and colorful vegetables or a green salad. A light complex carbohydrate-rich evening snack may help you sleep but avoid heavy, greasy foods or foods high in refined sugars. Studying a few examples may make this whole meal planning thing easier, so here's a full week's worth. You don't need to follow the days in order; you can choose any meal plan, skip one or repeat as you like. This week's meal plan was designed for a person who needs about 2,100 to 2,200 calories per day and doesn't have any dietary restrictions. Your daily calorie goal may vary. Learn what it is below, and you can make tweaks to the plan to fit your specific needs. Each day includes three meals and three snacks and has a healthy balance of carbohydrates, fats, and proteins. You'll also get plenty of fiber from whole grains, fruits, vegetables, and legumes. Every plan includes three meals and three snacks to keep you feeling satisfied all day long. Some days even include a glass of beer or wine. Feel free to add more water, coffee or herbal tea to any day, but keep in mind that adding cream or sugar also adds calories. It's OK to swap out similar menu items, but keep cooking methods in mind. Replacing a sirloin steak with grilled chicken is fine, but replacing it with chicken-fried steak isn't going to work because the breading changes the fat, carb and sodium counts—and the calories. Finally, you can adjust your calorie intake by eliminating snacks if you want to lose weight or eating larger snacks if you want to gain weight. Today's meal plan contains about 2,250 calories, with 55 percent of those calories coming from carbohydrates, 20 percent fat, and 25 percent from protein. It also has about 34 grams fiber. Today's meal has about 2,260 calories, with 55 percent of those calories coming from carbohydrates, 20 percent from fat, and 25 percent from protein. It also has 50 grams fiber. By the end of today, you'll consume about 2,230 calories, with 54 percent of those calories coming from carbohydrates, 24 percent from fat, and 22 percent from protein. You'll also get about 27 grams fiber. Today's meals and snacks have about 2,200 calories, with 55 percent of those calories coming from carbohydrates, 19 percent from fat, and 26 percent from protein. You'll also get about 31 grams fiber. Today's menu contains about 2,200 calories, with 54 percent of those calories coming from carbohydrates, 22 percent from fat, and 24 percent from protein. There's also 46 grams fiber. Planning healthy meals isn't difficult but if you're not used to it, the planning can take a little practice. The examples we provided should give you a great start. Don't feel discouraged if you don't stick to the plan exactly as outlined—it's OK to make variations that fit your lifestyle and needs. Just do your best to incorporate healthy choices into your day—vegetables, fruit, lean proteins, beans and legumes, and whole grains are always smart bets.